The aesthetics of synthwave, if not the music itself, have enjoyed the occasional resurgence since the music genre first appeared in the 1980s. Now is one of those times, thanks largely to internet memes and a certain inherent cultural stickiness that the neon-on-black look has. Hypergun is the latest game to bank heavily on that look, and it’s out now on Steam. 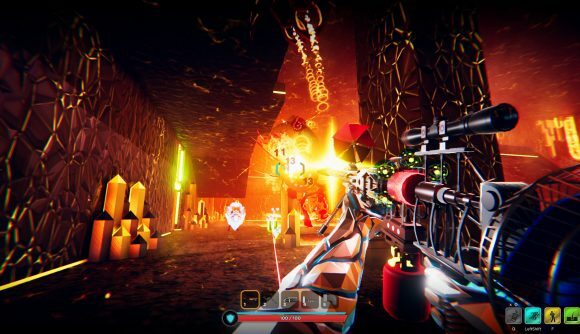 Like the neon-drenched games that have come down this road before, Hypergun brings a healthy level of irony with it – after all, we can’t fully acknowledge that a retro style was cool without a wink and a nod, right? You’re Dewey Owens, an intern at DevTech Labs who spends his spare time frolicking about in DevTech’s combat simulation program trying to build the ultimate weapon – the Hypergun, if you will. This means procedural levels and modular weapons, which you get to slap together as you pick up components. Again, this isn’t exactly uncharted territory – you’ve got hints of Borderlands, Heavy Bullets, Far Cry: Blood Dragon, and even Paranautical Activity all on display here. But Hypergun’s look is so drippingly excessive that it’s hard to look away, even as the on-screen colors glow beyond their boundaries almost enough to burn retinas.The guns themselves look like kit-bashes – they’re thin and spindly, like parts screwed onto a thin metal frame. For more upcoming titles we’re excited about, check out our roundup of the most exciting upcoming PC games. Components for your guns include 3D glasses and a banana (for some reason), so again, it’s not a game that’s in danger of taking itself too seriously. Hypergun’s procedural levels may all be different, but it does run into the issue of creating a lot of different, random levels that all feel basically the same. Still, it’s got two things that are crucial for a shooter: Circle-strafing and style. The humongous boss fights are just icing on the cake.